Mobile operator Globe Telecom launched on Wednesday, July 8, a “complete suite” of methods on how to access social media site Facebook without incurring data charges. Globe customers can now access free Facebook in three ways: with a new in-app feature that allows them to choose the type of Facebook access, by buying a new TM (Touch Mobile) SIM that gives them free access for seven days, and through a GoSURF subscription. According to Facebook’s official data, as of March 2015, monthly active users on Facebook in the Philippines has reached 43 million. This represents 23% growth when compared to March 2014. On the same period, mobile monthly active users reached 35 million, a 35% growth compared in the previous year. Daily active users hit 23 million, a 28% growth year-on-year. Finally, mobile daily active users in the Philippines reached 18 million, a 50% growth when compared to March 2014. 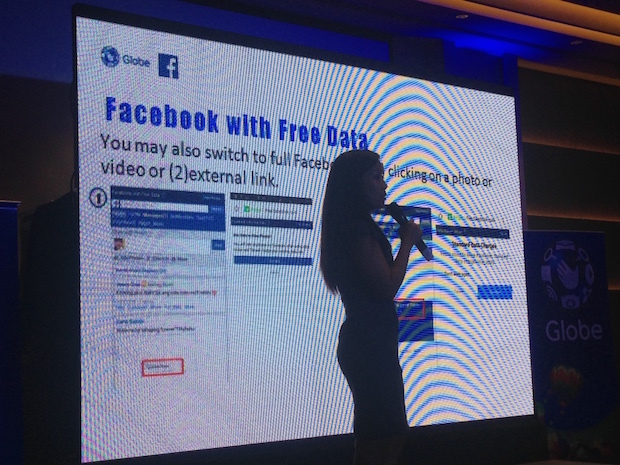 “As more customers are embracing the digital lifestyle, we want to provide Filipinos more ways to access Facebook with free data and connect them to the rest of the world,” said Dan Horan, senior advisor for consumer business at Globe. Facebook with free data is a zero-rated, lightweight version of Facebook with limited access to photos and videos. Developed for people who are conscious of spending their mobile data, Facebook with free data will give customers more control over their data usage. To use Facebook with free data, Globe customers will download and launch the latest version of Facebook for Android. They can also visit www.facebook.com in a browser on their mobile. They will then be prompted to opt in or out of Facebook with free data. If they opt out, they will automatically be directed to the full version of Facebook and charged their regular data rate. Those who opt in can begin browsing Facebook for free. People using Facebook with free data will also get a data control button at the top of Facebook, which lets them easily switch between the free and the full versions of Facebook at any time. This button clearly indicates which version of Facebook the customer is currently using, and can be dismissed so as not to disturb browsing. When a customer clicks a photo within Facebook, an external link, or any content that leads outside the Facebook app, they will be notified that they are leaving Facebook with free data and will be charged for data usage. Available for P30, customers who have purchased the TM Choose-Your-Number SIM will also receive the bonus of free access to the full Facebook experience for seven days. Besides allowing customers to choose their own mobile number, the SIM also allows customers to register to different call, text, and mobile Internet promos. Mobile devices must be internet-capable and have a maintaining load balance of P1 in order to access free Facebook on TM SIM cards. For customers who want a full experience of Facebook with photo and video streaming access, they can register to a GoSURF data plan to access the social networking site for free. Available to Globe Prepaid and TM customers with a GoSURF subscription and to Globe Postpaid customers who will opt-in to the free Facebook promo, free access to Facebook works on any mobile platform, including the Facebook Android app and browsers (via m.facebook.com), without any maintaining balance. Postpaid customers can access Facebook for free without any purchase requirement while Prepaid and TM customers will automatically get access upon purchase of any GoSURF promo. The validity of the free access to Facebook offer is the same as the subscribed GoSURF promo. Aside from Free Facebook, customers also get free access to premium content such as Spotify and mobile games with GoSURF. With GoSURF50, customers get 300MB of data to access the Internet and an additional free 400MB for music streaming and online mobile gaming for P50 valid for 3 days. The games include Clash of Clans, Candy Crush Saga, Candy Crush Soda Saga, Summoners War, Hay Day, Boom Beach, Soul Seeker, Dungeon Hunter 5, and Asphalt 8: Airborne. To get free access to Facebook on prepaid or TM via GoSURF, users can register to any GoSURF promo and wait for the Facebook activation notification which will be sent via text message. For customers who wish to avail of the bonus FB trial for TM SIMs, simply text BONUS FB to 8888. Facebook with free data launches once a customer has updated their FB app to its latest version and will automatically be available to those who are not on Postpaid or any GoSURF plan. For Postpaid customers, opt-in to free Facebook by texting FREE FB ON to 8888. To know more information, text FREE FB to 8888. To inquire about the promo, text FREE FB HELP to 8888. To check status, text FREE FB STATUS to 8888. I’m happy because of Globe Network, because I’m using free internet, even if I don’have load I can have free Facebook and I can use Messenger to communicate with my friends. Since summer is arriving and it’s Sembreak so it’s so boring, so through this free internet of Globe my summer is not boring anymore. Thank you Globe Network for having this.